The Porsche factory, picking very carefully the areas in which it will choose to compete, has another winner in the two-liter Carrera GTS, or Type 904, released in time for the 1964 season-at a European price of under $7500. One hundred will be built, homologated and, presumably, delivered by April. 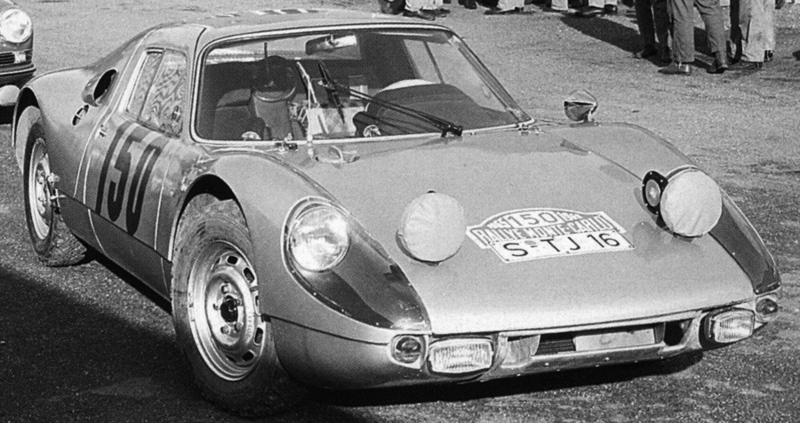 The 904 is a hodgepodge mixture of Carrera, Spyder and the new 901. The factory plans to drop a few eight-cylinder engines into the roomy chassis and run them as works prototypes, leaving private customers to compete in the GT division with Old Faithful, the four-cam four-cylinder, now with slightly larger valves and pumping out a reliable 180 DIN bhp. The "GTS," as it is called nowhere but in script on the right rear fender, is in living fiberglass; a Porsche patented version thereof called Pantal. The shells are molded by Heinkel and bonded directly to the frame side-rails, thereby gaining 50 % rigidity. The frame, comprising wide- based box sections, looks light but awfully archaic. 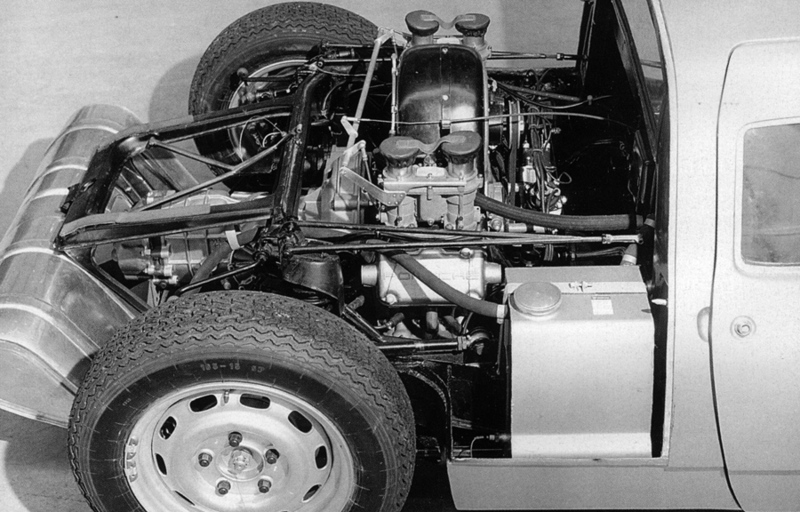 If you prang it, body and chassis (both designed by Porsche's Schroeder, who also did the more aesthetically - pleasing 901) must be replaced as a whole unit. The front suspension, derived from the Formula I cars, consists of double A-frames, coil springs and telescopic shock absorbers. At the rear, radius rods lead to a complicated system involving a single lower control arm, a reversed upper wishbone, an angled hub carrier, non-splined but double U-jointed halfshafts, a link to the anti-roll bar, coil springs and telescopic shocks. An anti-roll bar is also used at the front; other than these, there's not a torsion bar in sight. All pretty hairy, but it does give GP-caliber road holding. The five-speed transmission is a beefed-up version of the 901 unit, disposed behind the rear axle (engine amidships) and Dunlop-Ate disc brakes, similar to the 901's, are used at all four wheels. If you have a Teutqnic posterior, the bucket seats should fit well. They don't adjust; like Ford's Mustang, the steering wheels and pedals swing fore and aft. If, by some chance, the 904 is not the potent weapon it's expected to be in the two-liter class, the factory still has the eight-cylinder to offer as an option. Air-cooled horizontally opposed four, 4 main bearings. Carburetion. . . . Two Weber 46 DCOE downdraft Valve gear. .
Unit-construction, steel box-section rails reinforced with fiberglass superstructure. Suspension F: Ind., wishbones and coil springs, anti-roll bar. R: Ind., reversed upper wishbone, single lower control arm, coilsprings, anti-roll bar.